The rise of websites like Etsy, Folksy, and Bonanza have given skilled leather craftspeople an outlet to sell their wares without the baggage of traditional brick-and-mortar stores. Consumers are no longer happy with mass-produced products. Instead, they're looking for work from real artisans; something that screams originality, quality, and personal service. From purses and leather-bound books, to briefcases, luggage, tool belts, and wallets, it's an industry that is no longer considered a hobby or a dying art. Obviously, the salary for this kind of trade varies greatly depending on the items being produced, the client, time spent, and quality of the materials. Payscale has the top end salary at close to $80,000 a year. There is a big difference between a hair stylist and a barber. Hair stylists specialize in elaborate cuts, colors, highlights, treatments, and the latest looks. They have seen steady work over the years, and their clientele is mostly female. Barbers, on the other hand, cater primarily to men, offering a simpler range of cuts, plus shaving and beard/mustache trimming. The barber's pole has been sadly lacking from malls and city centers over the last few decades, but the career is on the up. 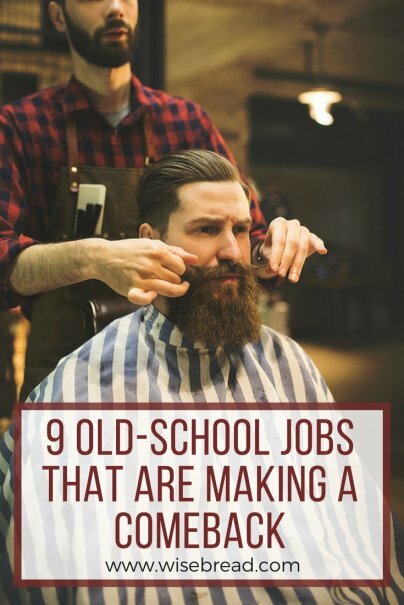 Men are wearing beards and facial hair, and are looking for experts in that craft. They also want to embrace the more traditional cuts of the past. While barbers generally get paid less than hair stylists, they can see more clients in a day, and some can earn as much as $70,000 a year. It's great to see carpentry coming back into style after years of consumer neglect. With the advent of cheap, assemble-it-yourself furniture, people began to balk at the prices of well-made tables or bookcases. But thankfully, quality is back in style. Carpenters are seeing much more work coming their way, with custom requests for cabinets, tables, doors, rocking horses, and all kinds of other beautiful creations. While the hourly rate for a carpenter can vary wildly — between $13 and $32 — some skilled woodworkers can earn upward of $72,000 a year doing a job they genuinely love. Maps are big business. The increasing use of detailed maps and geographic information in government planning has caused this seemingly dull industry to boom. The Bureau of Labor Statistics forecasts that jobs in cartography and photogrammetry will grow a whopping 19 percent over the next eight years, much higher than the average growth rate for other occupations. It's also a job that can get you out of the office on regular intervals, with extensive travel required to locations that are being mapped and surveyed. In 2016, median pay for this industry was over $62,000 per year, and it's on the rise. You will need a bachelor's degree in cartography, geography, geomatics, or surveying to land a position. For a while there, people who made a living selling food on the side of the street had it really tough. But now, the industry is exploding. Gourmet food trucks and carts are experiencing huge demand in towns and cities throughout America. The impact of social media, plus food review sites like Yelp, have made it possible for entrepreneur chefs to go it alone and make a solid living. Startup businesses and "cool" workplaces (think Google, Apple, and Pixar) often bring gourmet food trucks in to feed the workers, and business owners can spread the word using Twitter, Instagram, Facebook, and Pinterest. There are probably a whole bunch of different mobile gourmet selections near you right now. Before the introduction of vinyl cut lettering and machined acrylic signage, a hand-painted sign was a must-have for any business. But as automation took over, the quick, perfect, and cheap results that could be achieved from machines meant a lot of sign painters had to retrain as graphic designers and commercial artists. However, that is changing. The growth of small businesses that want a more organic and natural look and feel to their operation means hand-painted signs are back with a vengeance. The slight imperfections and unique designs portray a business that is less corporate and more friendly and approachable. Not only that, but hand-painted murals inside and outside of buildings are hot property, too. And while the average pay for a sign artist is just over $40,000 a year, a skilled sign and mural painter can easily earn more, traveling around the world for international clients and exhibits. Another artisanal industry that was ravaged by automation, cheese-making is becoming bigger thanks to the demand by millennials and gastronomes for rich, deep flavors and far more variety. Even a quick glance at the cheese counter in your local grocery store will show you just how much the choice of cheeses has grown. Now, this is translating to small businesses growing around the country, offering premium quality cheeses that pair beautifully with wines and craft beers. If you have an interest in becoming a cheesemaker, you'll need expert training. Luckily, the Cheese Society has a wealth of information for you. Established cheesemakers can earn over $60,000 a year. Also known as a shoe repairer or shoemaker, this career was popular until the automation and production of shoes made the prices drop drastically. Few people were willing to spend hundreds for a pair of shoes when they could get a cheap pair from a department store. However, a few things have changed that. First, the reduce/reuse/recycle movement has made people more aware of the waste we have in our society. Isn't it better to repair worn out shoes than to replace them? Also, consumers increasingly want quality over price when it comes to footwear, and now see a pair of good shoes as a necessary purchase. While simple shoe repair brings in around $25,000 a year, shoemakers can earn six-figure salaries. Remember when you'd go to the liquor store and have about 10 beers to choose from? That has all changed. Craft beers are huge, and the need for experienced brewers in microbreweries around the country is surging. According to the Brewers Association, in 2016 alone, small and independent U.S. craft brewers contributed a whopping $67.8 billion to the economy and added more than 456,000 full-time equivalent jobs. If you have a skill for brewing a mighty pint of ale, this is a fantastic time to look into it as a career.